Powder prepared with milk, sugar and cream, as per pack instructions to get vanilla flavored ice cream. • Mix 4 tablespoons (60 gm) ice cream powder and one cup of milk (200ml) into a paste. • In a separate saucepan, add 10 table spoons (150 grams of sugar) to 4 cups of milk (800 ml) and bring to boil over low flame. • Add the ice cream paste to the mixture, Stir for 2-3 minutes till liquid thickens. • Add 170 gm fresh cream to the mixture and chill for about two hours. Once chilled pour the paste into an ice cream maker and store in freezer till hard. 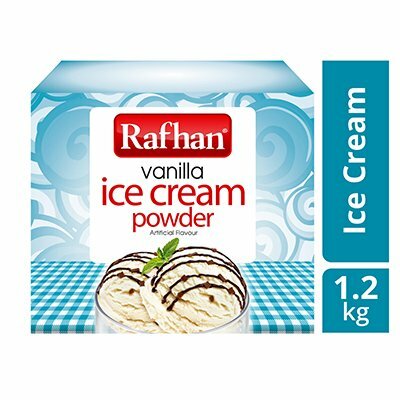 Rafhan Vanilla Ice Cream is ready to serve. Keep stirring the Ice Cream powder paste after cooking until the it cools to avoid top layer formation on the surface and lump formation.